PRIME Minister Narendra Modi on Friday expressed confidence that the Bharatiya Janata Party (BJP) will return to power with “absolute majority” after the April-May Lok Sabha election, saying the people have made up their mind to ensure victory of the National Democratic Alliance in 300-plus seats. He also said that people have already decided in favour of the BJP and are, therefore, not searching for a “competing face”. 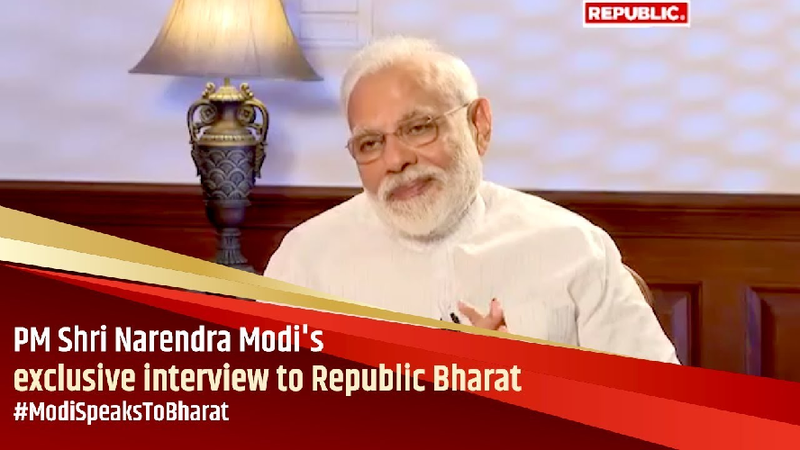 In an interview to ‘Republic Bharat’ news channel, he also said the timing of the launch of the anti-satellite missile was based on “open space” available to carry out the test. “Call it an adventure or an initiative, they don’t happen suddenly. You need to tell the global community that you want space at a particular time in (outer) space to ensure there is no space traffic or collision, you need to ask for an open space, you need to fix that space. It is a long process,” he explained. Prime Minister Modi rejected suggestions that the index of Opposition unity is high as compared to 2014. “If you go granular, you will find the Opposition more scattered now than in 2014. Tell me, has there been any agreement in Andhra (Pradesh), (West) Bengal? Has there been any (agreement) with Communist parties? Has it happened in Kerala, Odisha,” he said. He also rejected possibility of Opposition joining hands after elections, saying, “Today they are leaving no stone unturned to put each other down. You look at all their statements.” He also said that Opposition joining hands post polls can happen only if people give fewer seats to him. “When the people of this country have made up their mind to give highest number of seats to Narendra Modi, then what can happen? The results are certain. There is no doubt about that. The people of the country have decided to bring in a Government that enjoys absolute majority. They have made up their mind to give NDA a mandate for a 300-plus Government,” he asserted. He said for TRP, news channels rake up such questions. “It is important for you because...See in 2014 you had Manmohan Singh ji. You could not have gained TRP by pitting him against me. So you had to get (Arvind) Kejriwal who did not have a single MLA, a single corporator. But you had to pitch him as a future prime minister to run your shops,” he quipped. To a question on unemployment and the Opposition’s attack on the Government, the PM said he is trying to make new institutions so that there is a “perfect system”. He pointed out that when Atal Behari Vajpayee was the Prime Minister, the Opposition had also raised the issue of unemployment. “After Atal ji’s tenure, there were statistics that proved that there were 6 crore jobs in Atal ji’s tenure. And during UPA, there were only 1.5 crore jobs and yet they maligned Atalji’s Government. The Lutyens’ (Delhi) ecosystem kept beating the drums,” he said. “Four crore people have taken money for the first time. They must have started some employment, they must have employed somebody. What do I tell you? The registrations at EPFO, more than 1 crore people have registered. Money has to be given for this, it is not for free,” he said. The Modi said more roads are being built in India today than during previous Governments. “Is manpower not required for that? Railways are growing at twice the rate, is manpower not required for that? Today, there is a huge campaign for solar energy in India. It’s because of big investment. Are they saying, there’s no employment because of it? What are they saying? Do they have any basis? Will they say anything they like and keep shouting,” he shot back.